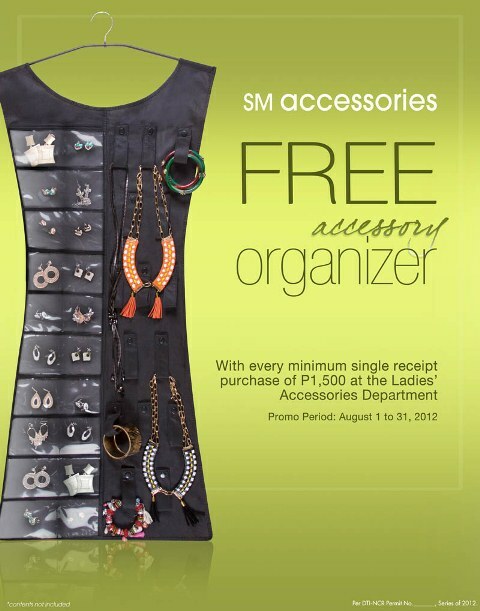 SM Accessories: FREE ACCESSORY ORGANIZER! SM Accessories has a special treat just for the ladies. Celebrate ladies’ month with us this August and get a free accessory organizer, for every Php 1500 minimum single receipt purchase at the Ladies’ Accessories Department. Promo period is from August 1 to August 31 only. This is perfect for sorting accessories that normally get piled up in the closet. Let's all put that messy closet back in order with the best SM Accessories organizer! Visit SM Accessories in any SM Department Store nationwide. Already got my very own! ;) How about you?